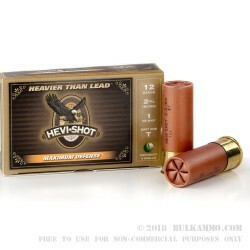 This 12 Gauge shotshell from HEVI-Shot’s Maximum Defense line of ammunition is loaded with one ounce of T shot. Its 53 .20” diameter pellets are made of tungsten alloy for added weight and hardness, so they have what it takes to penetrate targets beautifully. 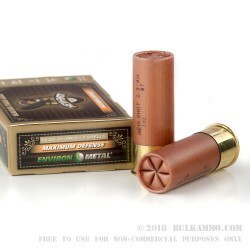 With the 1,255 fps muzzle velocity provided by this shotshell, you’ll possess reliable knockdown power that you can depend upon when you’re protecting what you hold dear. 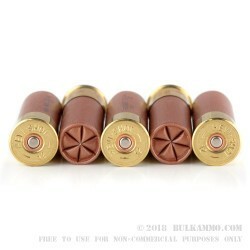 This shotshell is also practical for taking geese, especially when used in conjunction with an improved cylinder muzzle choke, but it is really best implemented in home defense like it is designed to be. HEVI-Shot is noteworthy for their pellets’ irregular shape, which they claim boosts lethality and reduces drag. Their pellets still resist deformation, however, which combined with their nanoparticle lubricant creates a tight pattern.